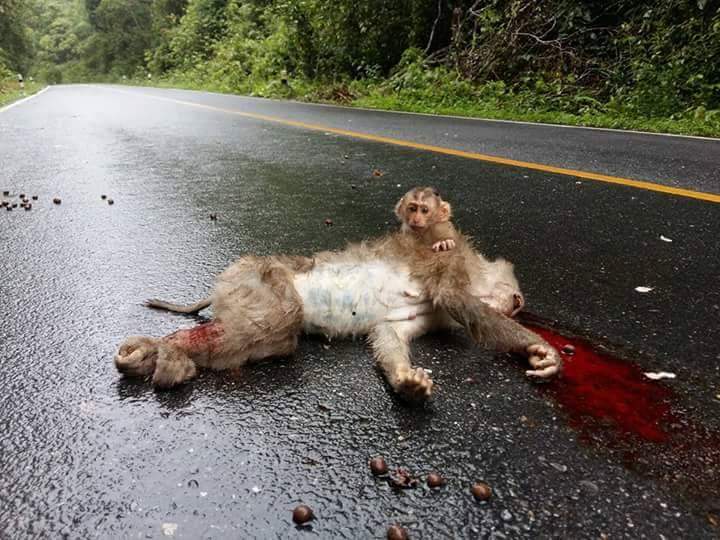 A young macaque clings to its mother’s body, killed on a Khao Yai road this week. The baby’s confused cries are heartbreaking. Macaques are often seen along the roadside in the park, waiting for food from visitors. Visitors are strongly discouraged from feeding wildlife and face a THB 500 fine if caught doing so. Feeding animals by the road is particularly harmful, as it attracts animals to a dangerous area where they could be hit by vehicles – sadly demonstrated in this recent case. Dramatic growth in the number of people vising Khao Yai National Park over the past decade means there are more vehicles on the road. There are reports that monkeys are becoming bolder in seeking out food from humans. To avoid unfortunate incidents that injure or kill wildlife, please help share this message asking visitors to drive slower and with care. See our Wildlife safety tips for drivers. What’s the rush? Slower speeds give yourself and wildlife more time to pass safely, while also giving your passengers more time to enjoy the sights and sounds of the park. Update: Park officers inform us they guided the orphaned baby macaque back to the group, hopefully giving it a chance to survive.